New iMac Now Available to Order in the U.S.
Apple is now accepting orders for the new iMac on their online store. The new iMacs offer dramatically reduced thickness and add a brand new Fusion Drive that combines flash storage and a traditional disk-based hard drive to maximize both speed and capacity. The 21.5" model starts at $1299 and $1499 while the 27" model starts at $1799 and $1999. The 21.5" model is shipping in "1-3 business days" while the 27" model ships in 2-3 weeks. 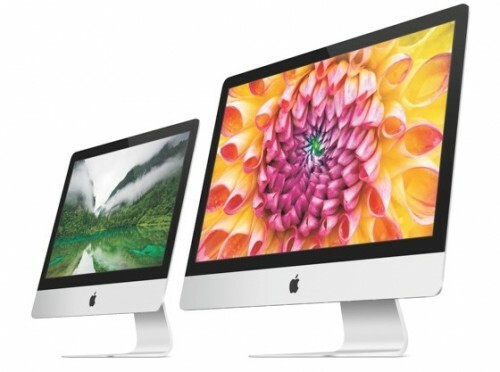 Limited stock of 21.5" iMacs should also be available in Apple retail stores starting today. The previously reported iMac build-to-order options were accurate with a variety of RAM, Processor, Hard Drive and Graphics Card upgrades available for specific models. We previously posted an unboxing video of the new iMac. opted for ram over fusion. Hope I made the right choice. Honestly, probably not. Although, I don't know what you'll be using the computer for. Ordered mine about 20 minutes ago. 7-10 business days for a fully decked out 21.5" model. Arriving a week before Christmas. I still can't help but feel the new iMac is a downgrade from the previous generation. Already ordered mine, good night! Apple fanboys must order fast due to supply constraints. Uhh, I think this is the gloat and smile, not the mope and gripe thread. Sorry to bash majkom; I'm happy with my purchase. I Apple has just signed the death warrant for the iMac. Yup, nobody is going to buy this new iMac at all. I guarantee it.